We all live in Kansas now. 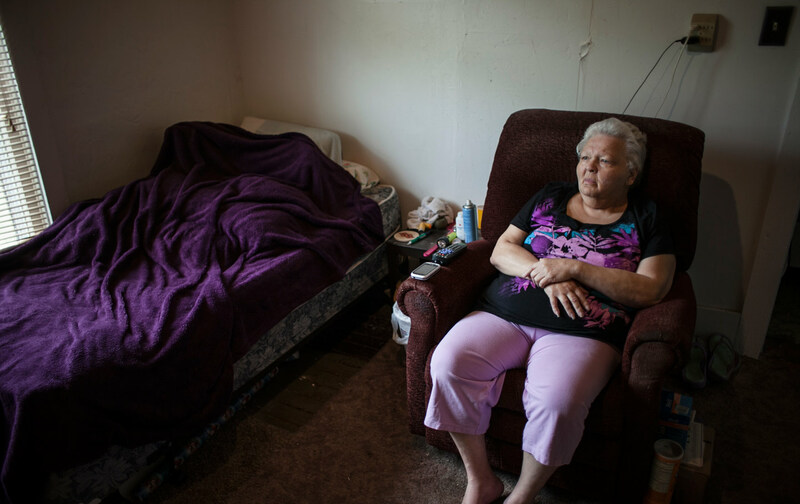 In June 2015, I wrote about RaDonna Kuelkelhan, a 59-year-old woman from southeast Kansas who was fighting to get health care. A treatment for larynx cancer caused a series of collateral problems that made it hard for RaDonna to eat. Her doctor was unable to treat the problem aggressively because she had no insurance, so RaDonna was wasting away, slow-walking toward an avoidable death. Her corner of the state is one of the poorest and sickest regions in Kansas. It is also overwhelmingly white and deeply conservative—Trump country. I met few people in the area who thought politics played a role in why they couldn’t afford health care. One clinic administrator told me that her patients had been poor for so many generations that they just considered bad health care an intractable fact. Problems like RaDonna’s inability to qualify for Medicaid were attributed to government incompetence rather than political ideology. It doesn’t matter how blue your state is; under Ryan’s plan, it won’t have enough money to cover health-care costs. Many more doctors will know this horror if House Speaker Paul Ryan and President Donald Trump succeed with their health-care “reform” plan. Many people who read RaDonna’s story reacted to it with a sort of detached pity, even judgment: How could those poor fools in Kansas support politicians who sentence them to untreated illness and death? Well, we’re all in Kansas now. Ryan’s American Health Care Act (AHCA) has rightly been called a tax break for the wealthy masquerading as reform. But it’s much more than that—it’s a vehicle for Ryan and other traditional, pre-Trump Republicans to achieve their decades-old goal of taking apart the Great Society. They colluded with neoliberal Democrats to end welfare, defund public education, and deregulate a predatory financial industry in the 1990s and 2000s. What’s left now is Medicare, Medicaid, and their promise that no American is too poor to get health care. Ryan’s bill would unambiguously end that promise. The AHCA’s repeal of the Affordable Care Act’s “individual mandate” is the least of it. Ryan would not just halt Obamacare’s Medicaid expansion; he would shrink it by at least 14 million people over the next decade, according to the Congressional Budget Office. Given the sweeteners with which the administration is enticing far-right lawmakers, even that estimate is likely too rosy. Currently, Medicaid costs are shared by the federal government and the states in a roughly 60/40 split. The states administer the program and have enough skin in the game to control costs, while the feds’ unlimited majority contribution ensures a nationwide safety net. Washington sets the ground rules, but states can apply for waivers to adjust for their particular realities. The politics of waivers has defined health care for the poor for decades. Following Bill Clinton’s failed health-care effort, Democratic governors began applying for waivers to expand their programs. Under George W. Bush, Republicans sought waivers to shrink theirs. To attract Republican support for the Affordable Care Act, Barack Obama allowed the long-sought conservative “experiment” of billing Medicaid enrollees. As governor of Indiana, Vice President Mike Pence created a program in which enrollees pay premiums; those who can’t get less coverage. In March, the Trump administration sent a letter to the governors of all 50 states urging them to act more like Indiana. But Ryan wants a much more radical reform. Under his bill, the federal government would no longer cover 60 percent of Medicaid’s costs. Instead, the federal contribution would be capped at its 2016 level, increasing only with the medical Consumer Price Index. This idea screws states coming and going: Smaller states that spend relatively little today would be forever stuck at that level, and those with large populations of poor and aging residents would never be able to keep up with rising costs. It doesn’t matter how blue your state is; it just won’t have enough money. Medicaid accounts for a large share of state spending—second only to K–12 education. That’s because poor people are just like the middle class in one respect: Their real health expenses aren’t for wellness screenings, but for long-term care for the aging and those with debilitating illnesses. Even if states foist the costs on Medicaid enrollees, the only way to make budgets work under Ryan’s plan would be to dramatically restrict coverage for the people most in need—people like RaDonna. RaDonna became seriously ill in 2010, just as incoming Kansas Governor Sam Brownback began one of the GOP’s most extreme state-government makeovers. Kansas already had one of the country’s stingiest Medicaid programs: In 2010, a family of three earning more than $5,859 a year was too rich to get help. Among the first things Brownback did was to reject Obamacare’s Medicaid expansion and sue the federal government for offering it. He insisted on the same lie that Ryan and the White House are offering now: Help breeds dependence. This is also the pernicious smear used to justify ending welfare for millions of women and children in the 1990s. But it’s particularly cruel in this case, because the whole point of the Medicaid expansion was to allow the working poor to keep their jobs without disqualifying themselves for assistance by making “too much.” In states like Kansas, even a poverty-wage job disqualifies you from assistance. Of course, welfare was another antipoverty program we decided to blame for poverty. But when Congress dramatically reduced the rolls, poor people didn’t get jobs; they were just left with no help. Likewise, when Ryan and Trump dramatically shrink Medicaid, poor people won’t stop getting sick. They’ll just be left to die.